Here's some great work - not ours, although I kinda wish it was - illustrating the powerful intersection of creative content and earned media attention. It's a campaign designed to reduce drink driving by connecting men in pub toilets with a convicted drink-driving inmate, in prison. The story below and video within explain the creative strategy pretty clearly, and while it's obvious the 'man in the mirror' approach can only reach a small number of drinkers in the moment, the attention gained from the video by journalists and social sharing has enormous potential. Lesson: great content is created to generate earned attention by design, not by accident. Thanks Andrea in New York for the find. 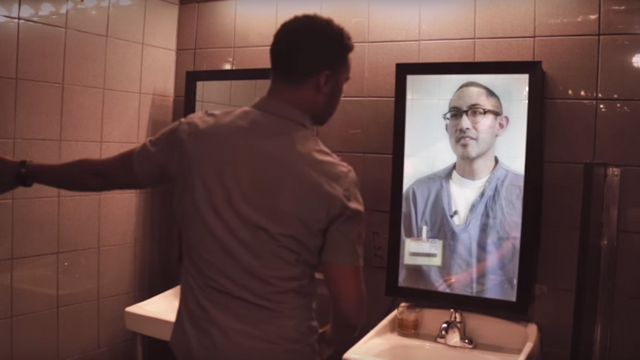 Created by Bravo/Y&R Miami and Paraná Films, the three-minute web video, "Reflections From Inside," features footage shot in two disparate locations—the men's bathroom of a bar in Los Angeles, and the RMC Correctional Facility in Lake Butler, Fla.